MPs leave the old chamber for the last time. The army hands over security to the police. Former MPs present for the inauguration, including Lawrence Gonzi. 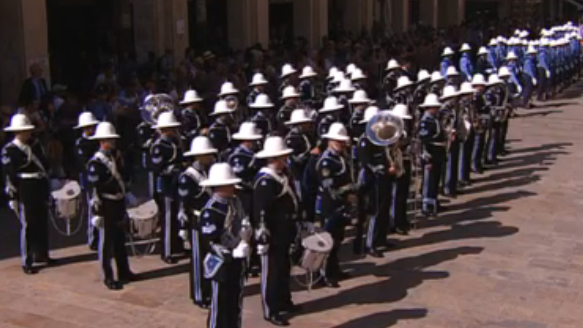 The police band and guard of honour lined up opposite the new Parliament House after marching from the Palace. 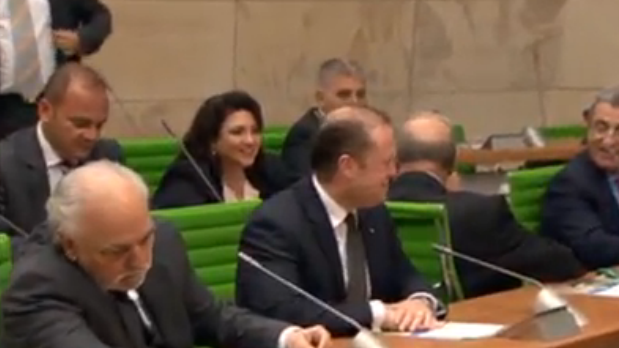 Prime Minister Joseph Muscat and Deputy Prime Minister Louis Grech familiarise themselves with the new surroundings. 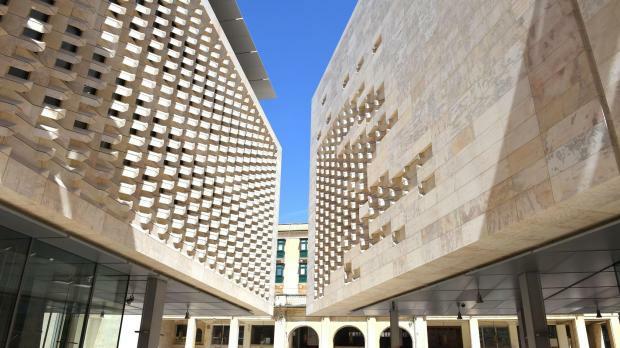 Malta's first ever purpose-built Parliament House was inaugurated today, with Speaker Anglu Farrugia hailing the event as an important step forward for parliament to be truly autonomous of every institution. 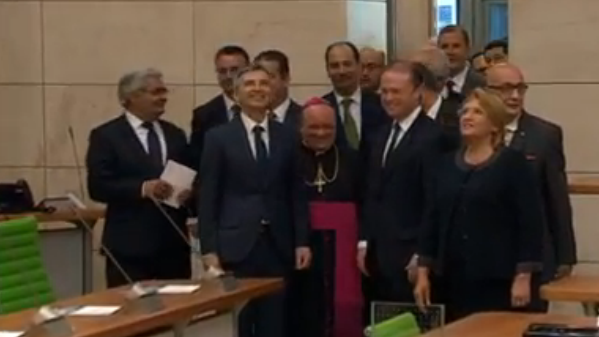 The building, whose design by architect Renzo Piano led to years of controversy, was inaugurated by President Marie-Louise Coleiro-Preca. 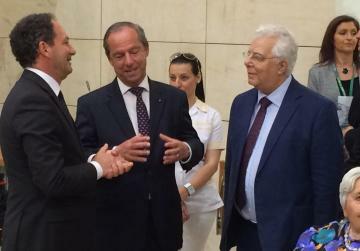 Former Prime Minister Lawrence Gonzi, who launched the project, was among former MPs present for the ceremony but Mr Piano did not attend and was never mentioned in the ceremony. The ceremony started in the old chamber of parliament where MPs gathered for a final photograph. 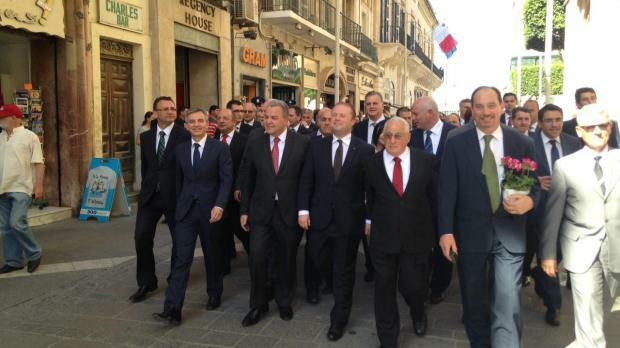 Led by the Speaker, Prime Minister Joseph Muscat and Opposition leader Simon Busuttil they then walked past the first chamber of parliament - the Tapestry Chamber used between 1921 and 1976 - and out of the palace into St George's Square where the police band and a guard of honour had formed. A contingent representing the army, which was to date responsible for security, then handed the 'keys' of the chamber to the police, who are taking over security. The MPs then walked up Republic Street to the new Parliament House accompanied by the police band as a small crowd of onlookers applauded. 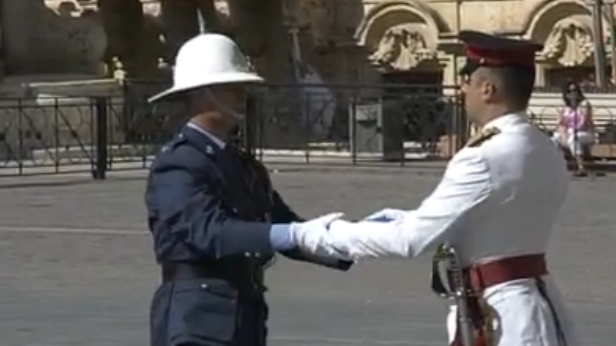 Among the MPs taking part in the ceremony was former Labour minister Joe Debono Grech the only serving MP who had also sat in Parliament when it was housed in the Tapestry Chamber and then, after 1976, when it moved to the former armoury. both at the palace. Labour whip Godfrey Farrugia and his wife Marlene carried flowering plants. Dr Farrugia referred to Oliver Friggieri's novel Fil Parlament ma jikbrux fljuri and said he believed flowers do grow in Parliament and they should be cared for. He said the plant would sit in his office..
Former Prime Minister Lawrence Gonzi, who commissioned the project, was among the former MPs invited for the ceremony. Also present is former President and Prime Minister Eddie Fenech Adami, members of the judiciary and members of the diplomatic corps. On arrival at city gate the police band and guard of honour formed up opposite Parliament House and accorded the National Salute to the President. 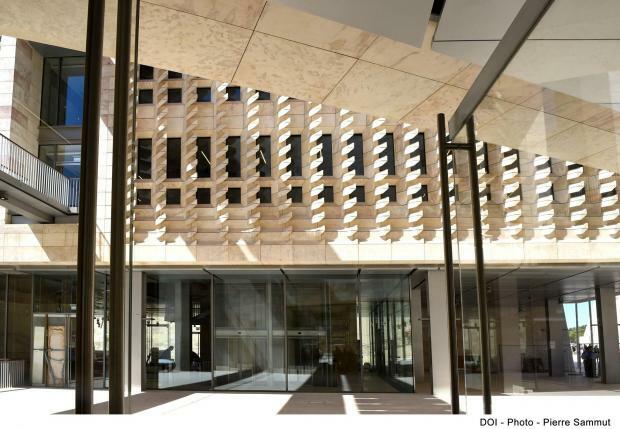 In an address just outside the building, Speaker Anglu Farrugia said the building of Parliament House was a step in the right direction, and a timely one. It was a reflection of how Parliament should be autonomous of any other institution. This year, he said, funds had been allocated in the Budget for Parliament to become truly autonomous, and the institution should continue to move in this direction. He said Parliament had a glorious history and he looked forward to more legislation to uphold the dignity of parliament, including the law on standards in public life. 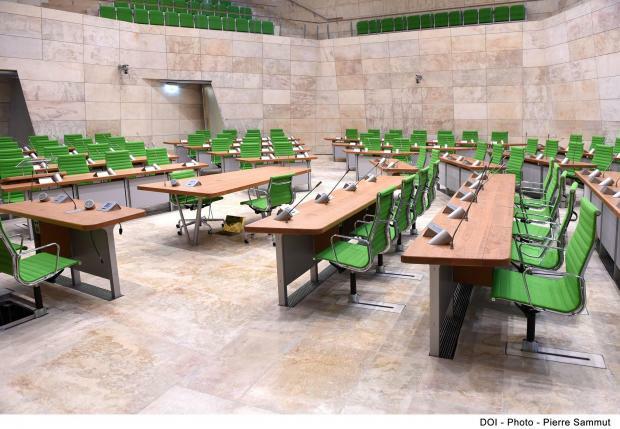 Dr Farrugia said Parliament was becoming more open and transparent, as also evidenced by the fact that video streaming of parliamentary proceedings would start from today. This was a quantum leap in parliamentary life and should be followed-up by a free to air parliamentary TV channel. 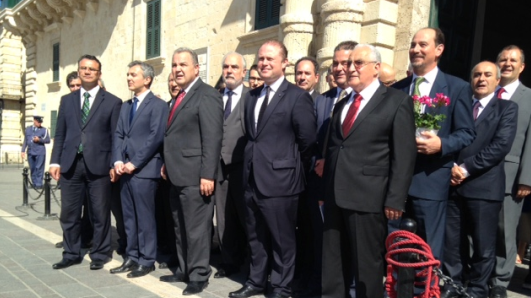 Dr Farrugia said today's ceremony showed a strong belief in democratic life. He wished all present more hard work in the interests of the nation. 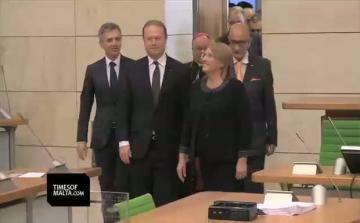 President Coleiro-Preca said today was a milestone in the country's parliamentary history. 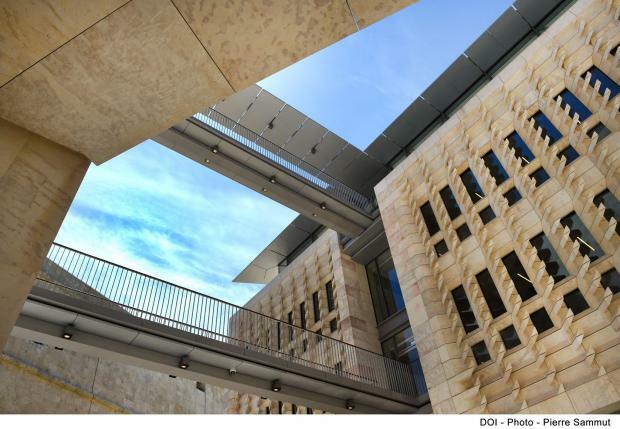 This new building was an opportunity for reflection on democracy and the benefits that came with it. A strong democracy was one which reflected the will of the majority and respected also the interests of the minorities including those who were socially deprived. 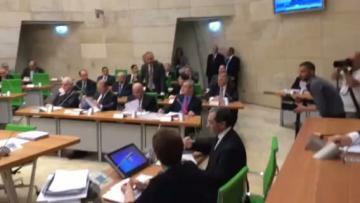 She regretted that women's representation in Malta's parliament was just 13 per cent and said this needed to increase if parliament was to be truly representative of society. In the House, she insisted, it should be the arguments which counted, not insults, and MPs should respect each other, and therefore the people who elected them. MPs should be examples of tolerance of each other's views. Parliament should adopt the best ideas from whatever side they came, because that reflected maturity. 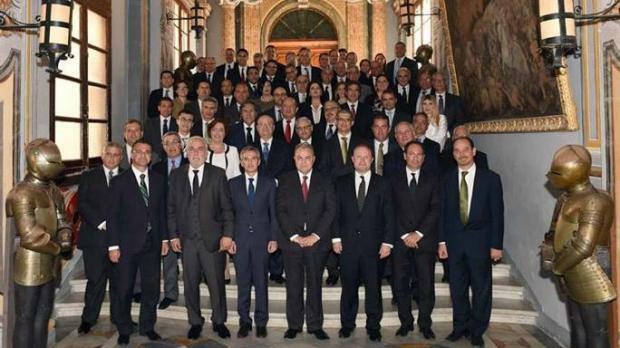 President Coleiro-Preca said she looked forward to an updating of the Constitution to reflect the people's current needs. She urged MPs to also hear pockets of society who have no voice, including migrants. MPs, she said, should also continue to work hard in Europe for an international solution to the migration problem. MPs should show courage and discuss the introduction of a social pay. They should also feel it their duty to safeguard the environment. Parliament should not have a monopoly in the democratic process but should rather promote its dissemination to all strata of society. Democracy was built every day and needed to be cared for every day, she said. At the end of the President's speech a police detachment marched towards the building and the Police Commissioner handed the keys of the new Parliament House to the Speaker. 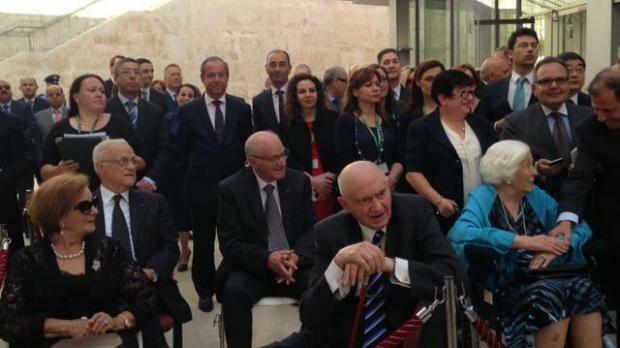 The President then unveiled a commemorative plaque and the building was blessed by Archbishop Charles J Scicluna. The Archbishop then presented a painting of St Thomas More, patron saint of politicians. The painting was made by artist Manuel Farrugia. The guests then moved in to the new Chamber, with MPs having the opportunity to try out their new seats. The ceremony ended shortly after 5 p.m. and the first sitting in the new parliament started an hour later.